According to President Donald Trump’s campaign announcement, Fox News’ Sean Hannity will be appearing at Monday night’s rally, along with conservative talk radio host Rush Limbaugh. 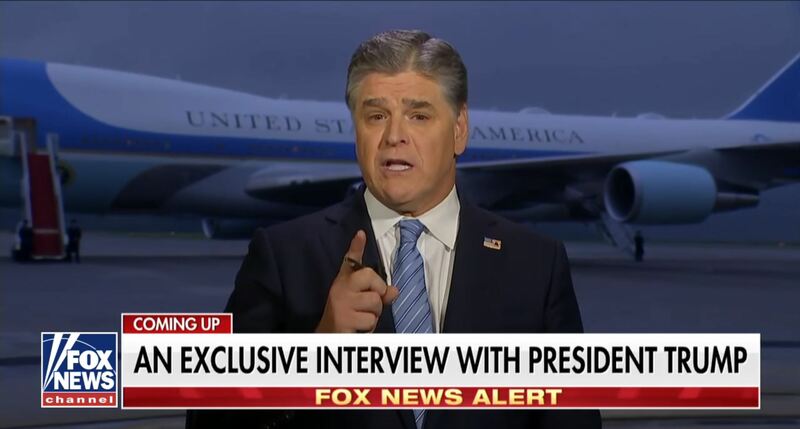 The pair, according to the campaign’s press release, “are longtime friends of President Trump” and “strong advocates for the President’s America First agenda.” In addition to campaigning with Trump, Hannity will interview Trump for his Fox News show, which the network is already hyping as a “powerful interview” even though it hasn’t happened yet. There’s no distinction between Trump’s communication shop and Fox News. It’s so well-recognized at this point that the line between Fox and Trump does not exist that neither party is even bothering to pretend anymore. This was evidenced by a campaign press release hyping Hannity’s rally participation in order to further drum up support. Fox News advertisers are already under fire for aligning with Fox’s extremism and political chicanery -- and already most major brands refuse to advertise on Fox’s more extreme and bigoted prime-time programming. At this point -- and especially tonight -- any company still advertising on Hannity’s show is effectively sponsoring a political event. Well-regarded companies already have no excuse for continuing to advertise on Hannity’s show, but now at minimum they should take action and ensure that their ads are excluded from tonight’s joint Trump-Hannity campaign rally. I reached out to many of Hannity’s current advertisers and was shocked by how comfortable many seemed to be with sponsoring a joint Trump-Hannity rally. Any advertiser that sponsors this event should know that Media Matters will spend 10 times more money than they spent on their Fox News ad directly reaching out to their customers to let them know what they did. I strongly hope these advertisers reconsider supporting Hannity’s show altogether, but at minimum, at least refuse to sponsor a Trump-Hannity rally.